Everyone from the members of your nursery class through to students attending your Art Classes will find the practicality of our 12 Block Watercolour Paint Set highly effective. 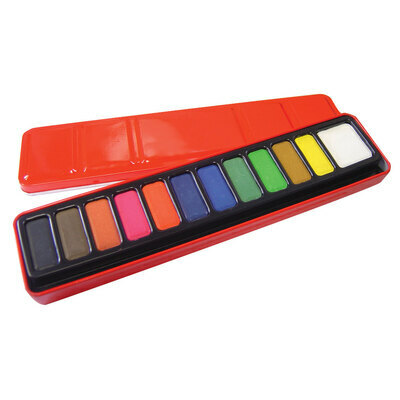 Presented in a sturdy and protective tin, this rectangular block features 12 solid colours that each come to life with the application of water The indented lid has been specially designed to act as a mixing pallet, allowing this paint set to become a much-trusted companion during every painting session. Each watercolour can be easily mixed with each other to help younger children understand the formation of colours while the ease with which these solid blocks transform into functional paints is something that every avid artist is sure to appreciate.